AUSTRALIAN Navy chaplain Fr William Evans had good reason for his deep affection for America and Americans. In August 1942 at the Battle of Savo Island off Guadalcanal the destroyer USS Patterson saved his life along with 401 shipmates from the Australian heavy cruiser HMAS Canberra after it was fatally attacked by a large Japanese naval force. More than 1000 Allied personnel (US and Australian) died in the battle with another 700 wounded. The Japanese sank the US cruisers Quincy and Vincennes, and the cruisers HMAS Canberra, the USS Astoria and Chicago and US destroyers Ralph Talbot and the Patterson herself were badly hit. Canberra had to be scuttled as a result of her damage. USS Patterson was helped in rescuing the Canberra’s survivors by the destroyer USS Blue. The experience had a great effect on the 36-year-old priest, instilling in him a desire to commemorate in some permanent way the friendship between Australia and the United States. The Regina Coeli Memorial church in the Sydney suburb of Beverly Hills was the realisation of Fr Evans’ dream – dedicated as a memorial to “Australian American Friendship in War and Peace”. 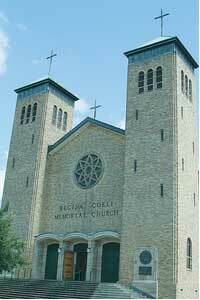 According to the parish history, permission was given in 1954 to change the name of the parish from the original “Queen of Peace” to “Regina Coeli”, a title which had been recently proclaimed. Fr Evans, the first parish priest, was hopeful that Catholics in the United States would be not only able but happy to make donations to help fulfil his dream, and he travelled to America in search of that support. But American parishes were preoccupied with the demands of their own building projects disrupted by the war effort and apart from a donation of $1000 from Cardinal Spellman of New York he received no help. Nonetheless, the plans proceeded and the foundation stone was blessed by the Archbishop of Sydney, Cardinal Norman Gilroy on Coral Sea Sunday, May 6, 1962. The next year, again on Coral Sea Sunday, the church was officially opened. Sadly, three years later, Fr Evans died of a heart attack at the age of just 59. For many years the church was the venue for the annual Coral Sea Mass which commemorates the Battle of the Coral Sea in early May 1942. It was one of the major turning points of the Pacific War. 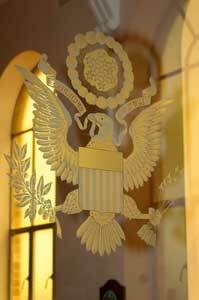 The church features an American Marian chapel in which is displayed the US flag and a glass wall bearing the US Coat of Arms. Along the side of the chapel are plaques from visiting US Navy ships, including the destroyer USS Goldsborough and the submarine USS Sculpin. 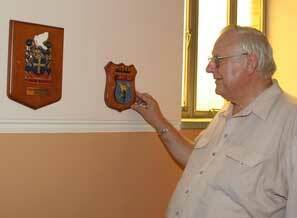 Fr Hilder examines some of the US ships’ plaques in the American chapel. On the opposite side of the church in the Australian chapel the Australian flag is displayed with a similar etching of the Australian Coat of Arms. The Australian Coat of Arms is also displayed on the altar rails gate. 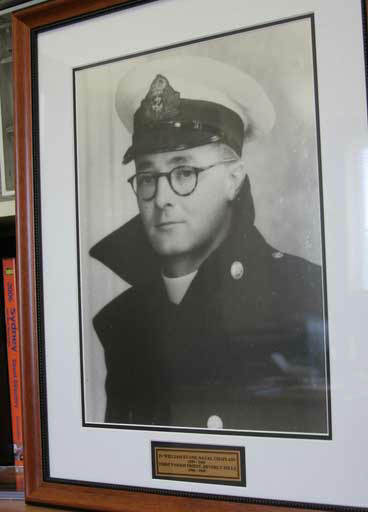 Current parish priest Fr Paul Hilder would like to add the plaque of the USS Patterson, the ship which saved so many of the crew of the HMAS Canberra and inspired Fr Evans’ dream to build his memorial church. Fr Hilder has been unable to make contact with any former crew of the ship which was decommissioned in 1945 and later sold for scrap. “I think it would be fitting to honour the ship and its crew by having its crest on the wall of the chapel,” Fr Hilder said.